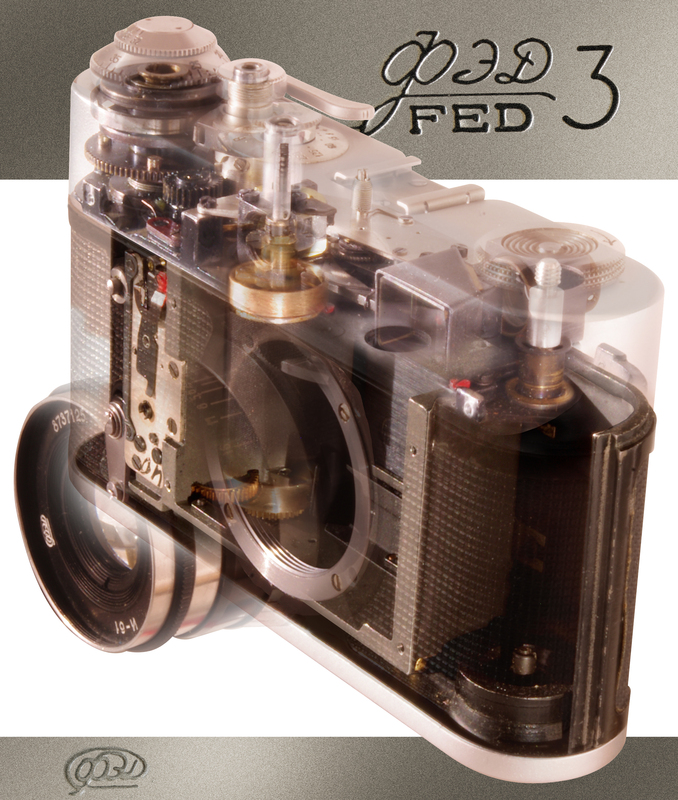 The FED 3 is a coupled rangefinder camera that followed on from the FED 2, but introducing slow speeds. For a time both FED 2 and 3 were manufactured in parallel, in all it's forms FED 3 production ran from 1962 to 1980. Initially featuring a stepped top housing, in 1963 FED swapped to the flatter top to produce what I consider to be the most handsome looking of the FED models, with a passing resemblance to the Leica M3. It essentially remained in this form with a change of covering, lens enhancements and several minor mechanical differences internally for the next 17 years. The shutter mechanism remained similar to the earliest FED 1 and it's Leica II copied arrangement and accordingly the shutter speed selector only indicates the correct speed after the shutter is cocked. However, far from simply copying cameras at this time, FED exhibited some ingeniuity of its own and instead of adopting the Leica III slow speed solution, they cooked up their own mechanism which slips over the selector spade internally and delays it before letting the second curtain go. It's a very neat solution and internally the top housing is pleasantly clear of complicated linkages as a result. Perhaps the only quirky outcome of this is the spacing and order of the shutter speeds around the selector. An odd styling feature is the mixture of square and circular viewfinder windows, a pragmatic styling choice as the round window is arranged to rotate - to allow for vertical adjustment of the rangefinder images. Distance adjustment can likewise be made without taking off the top housing by removing the blanking screw by the main rectangular viewing window, then feeding in a screwdiver to locate the end of the adjustment screw hidden within. Again, well thought out and the build quality and finish is good. Our example is a 1968 model and was kindly donated in August 2016 by Mr. Vladimir Furman, when we were travelling in Irkutsk, Siberia. The camera had seen better days, it's shutter curtain tapes had clearly come adrift, the lens barrel was badly damaged from a drop and clear evidence of an earlier effort to explore its workings was betrayed by a total absense of dress screws in the body. This was clearly a camera that needed rescuing having suffered in the Siberian climate. The good news with such a starting point is that I know I can't really do it any more harm. The other good news is that, aside from the dropped lens, cosmetically the FED was in very nice condition. Dismantling the FED 3 is a joy in fact, it follows entirely conventional practice throughout and is logically arranged with few awkard traps. From the outset I knew I was going to source a donor camera and a partially working but tatty example was secured for all the external dress screws. The plan was to retain as much of the original Siberian camera as possible, but it rapidly became apparent that the shutter curtains were beyond saving as the tapes were shredded. The donor gave up its shutter curtains, slotted speed selector wheel and all external screws. However everything else was saved, including the FED I-61 lens, the barrel of which was straightened and the threads cleaned then greased. That won't be the end of the donor, it will be used for a cut-away image in due course. Without any manuals or a working shutter to start with, it took several attempts to fathom out the exact way to get the curtains in, and now I can confidently reassemble a FED 3 shutter in minutes! Joyously FED 3 No. 8560017 is now a very tidy working example once again, and joins the LICM to represent more than 1.3 million of its brethren. The donor camera used to repair 8560017 was ultimately sacrificed to produce this image, it seemed a fitting end as it gave up its shutter amongst other bits. The image isn't really that informative, but just hints at the internals, if you are curious you can download the high resolution version by clicking on the image.